The Habitat Professionals Forum (HPF) is a voluntary affiliation of international and regional associations of Human Settlements Professionals involved in sustainable urban development. The HPF aims to foster cooperation and partnership between the Human Settlements Professionals and UN-HABITAT through dialogue and partnerships, and by providing leading-edge information and expertise that contribute to the implementation of the Habitat Agenda and sustainable urban development. Members will be independent, non-profit and non-governmental organisations that are international or regional associations of Human Settlements Professionals supporting sustainable urban development. To develop opportunities for synergy and partnership between the Human Settlements Professionals and UN-HABITAT, and to engage as a consultative group for UN-HABITAT. To promote and disseminate professional practices in the field of human settlements to implement the Habitat Agenda through shared learning, training and evaluation. To promote the establishment of common values and ethics for professional practice in the field of human settlements. To advocate the need for professional capacity and learning in the field of human settlements, and develop the necessary knowledge, skills and exchange of experiences amongst our own professions, policymakers and the general public. To enhance partnerships through a global network of Human Settlements Professionals. To promote exchange and dialogue between Human Settlements Professionals and help them to contribute to UN-HABITAT policy debates and agendas and to take concrete actions around urbanization issues with other Habitat Agenda partners. The HPF will hold a business meeting every 2 years during the World Urban Forum (WUF). The purpose of the meeting will be to receive reports on the conduct and activities of the HPF since it last met; and to plan the activities and responsibilities for the next two years and identify necessary resources. The meeting shall elect a chair for the purpose of that meeting and an organisation from its membership to oversee the business of the Forum and fulfil the functions of a Secretariat for the Forum until the next meeting at WUF. The Chair and the Secretariat shall only be provided by a member organisation that is a UN-accredited organisation. 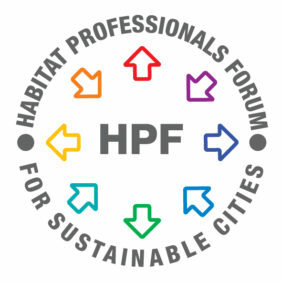 The HPF will convene an open Habitat Professionals Roundtable at each WUF. The HPF will propose and facilitate themed HPF Networking Events at each WUF for its members. The Secretariat will maintain a Professionals’ Page on the UN-HABITAT website that promotes exchange and dialogues between Human Settlements Professionals.